Feminine aspect of the bodhisattva of compassion, "Mother of all the Buddhas," Tara protects the welfare of all beings and those who are devoted to her are especially fortunate. 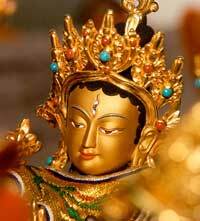 Tara was born from Avalokitesvara's tears of compassion. There are innumerable manifestations of Tara, as many as beings require bringing protection, long life and peace, overcoming obstacles and saving beings from danger. Here there is no man, there is no woman, no self, no person, and no consciousness. Labelling "male" or "female" has no essence but deceives the evil-minded world. "There are many who desire enlightenment in a man's body, but none who work for the benefit of sentient beings in the body of a woman. Therefore, until samsara is empty, I shall work for the benefit of sentient beings in a woman's body." Green Tara is seated upon a lotus arising from the waters of a lake, just as Tara is said to have arisen from the compassionate tears of Avalokiteshvara. Her right hand is in the mudra of supreme generosity indicating her ability to provide beings with whatever they desire. Her left hand at her heart is in the mudra of bestowing refuge: her thumb and ring finger are pressed together to symbolise the united practice of method and wisdom, and the three remaining fingers are raised to symbolise the Three Jewels of Refuge - Buddha, Dharma and Sangha. In each hand she holds the stem of a blue utpala flower. Each flower consists of three blossoms indicating that Tara, the embodiment of enlightened activities, is the Mother of the Buddhas of the past, present and future. Tara is dressed in the silken robes of royalty. She wears rainbow colored stockings, a white half-blouse and various jeweled ornaments. These symbolize her mastery of the perfections of generosity, morality and so forth. The tiara fastened in her black hair is adorned with jewels, the central one is a red ruby symbolic of Amitabha, her spiritual father and the head of her Buddha family. She is seated in a distinctive posture, her left leg withdrawn to symbolize her renunciation of worldly passion and her right leg extended to show that she is always ready to arise and come to the aid of those who need her help. With a warm compassionate gaze she looks down upon each sentient being as a mother regards her only child. Her emerald-green color -- related to the wind element and hence to movement -- signifies her ability to act swiftly and without delay to bring benefits to sentient beings. White represents the enlightened activity of pacifying, for example overcoming sickness, causes of untimely death and obstacles to success in one's life or one's practice. Yellow represents the enlightened activity of increasing the positive qualities conducive to a long life, peace, happiness and success in one's Dharma practice. Red represents the enlightened activity of power, or overpowering external forces that cannot be tamed through the first two activities, for example, removing obstacles to sickness, untimely death, etc., and forcefully accumulating conducive conditions for one's Dharma practice. Black represents the enlightened activity of wrath, which involves using forceful methods for accomplishing activities for enlightened purposes that cannot be accomplished through other means." "The Great Pacifier" because she pacifies negative obscurations. "Tara who Resonates with HUM"
"Tara who is Victorious over the Three Worlds"
"Tara who Crushes Others' Forces"
"Tara the Pulverizer of the Maras"
"Tara who embodies the Three Jewels"
"Tara Who Bestows Auspicious Conditions"
"Tara Who Blazes in Flames"
"Tara Who Saves by Means of HUM." "Tara Who Causes the Three Worlds to Tremble"
"Tara Who Eliminates Conflicts and bad Dreams"
"Tara Who Accomplishes All Enlightened Activities"
There are many inner obstacles to our mental development, and these inner obstacles can create external obstacles. To obtain success in our Dharma practice, to actualize the path to enlightenment, we need to rely on a special deity or Buddha, for example, Tara. All actions of the Buddha manifest in the female form, Tara, to help sentient beings successfully accomplish both temporal and ultimate happiness. To practice reciting Tara's mantra, OM TARE TUTTARE TURE SOHA, you can visualize Tara in front of you, with a white syllable OM at her crown, a red syllable AH at her throat and a blue syllable HUM at her heart. As you recite the mantra, visualize rays of light flowing from these three places, and striking your three places. These purify all negative karma and obscurations of your body, speech and mind created from beginningless time. Alternatively, you can visualize Tara on the crown of your head, and do the visualization as above. Recite as many mantras as you wish. At the end, pray to Tara to help you develop bodhicitta -- your practice of ethics, and your development of bodhicitta are what please Tara the most. This is the best offering you can make to Tara, and will bring you closer to her. Then, Tara dissolves into light, which dissolves through your forehead (or crown) and into your heart. Feel "My body, speech and mind are now blessed to become Tara's body, speech and mind." 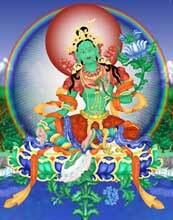 Then dedicate the merit that you will become enlightened -- like Tara -- in order to be able to help all sentient beings. OM represents Tara's holy body, speech and mind. TARE means liberating from true suffering, the sufferings of samsara, our aggregates being under the control of delusion and karma. TURE means liberating from the ignorance of the absolute nature of the I; it shows the true cessation of suffering. 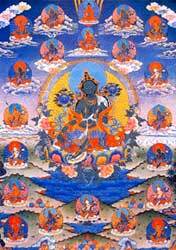 So the meaning is that by taking refuge in Tara and doing Tara practice, we can achieve the fully enlightened state with the four kayas, which is the state of cessation of, or liberation from, the two obscurations.